God of goodness and mercy, hear my prayer as I begin this Lenten journey with you. Let me be honest with myself as I look into my heart and soul, noticing the times I turn away from you. Guide me as I humbly seek to repent and return to your love. 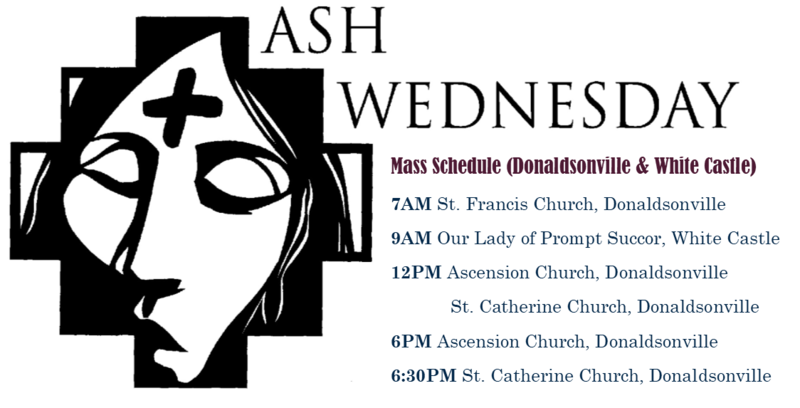 Transform me this Lent, heavenly Father. Give me the strength to commit myself to grow closer to you each day. Amen. 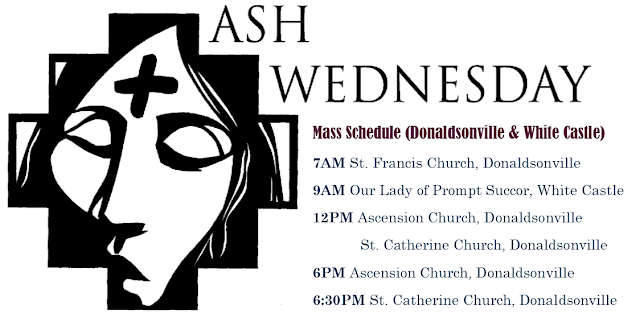 Ascension Church / Our Lady of Prompt Succor / St. Francis Church will be open 7AM-5PM for Prayer. Ashes will be available at the entrance on a table. From the time we get up in the morning, drink our cup of coffee, get the kids fed, drop them off at school, and arrive at work early, would you characterize your motivation to act as, “What’s in it for me?” You may have had many options on this Mardi Gras night, yet you chose to come to this Mass and pray the Divine Mercy Chaplet. And tomorrow, with the beginning of Lent with Ash Wednesday, you may be making a commitment to deny yourself a normal pleasure or to take on an extra spiritual exercise. Would you also characterize the motivation to do so as, “What’s in it for me?” Or instead, are all these actions based on a desire to please and to glorify God? In today’s Gospel, Peter comes off as self-serving when he told Jesus, “'We have given up everything and followed you." We may want to complete Peter’s sentence by saying, “So Jesus since we have given up everything, what’s in it for us?” Yet what Peter was really asking was, if it is impossible for a rich man attached to his wealth to enter heaven, what chances would someone have to enter into heaven if they gave up everything to follow Christ? Jesus responded answered that those who have given up much will be rewarded. However he also added, “many that are first will be last, and the last will be first,” which revealed his warning against anyone who prides themselves that they have found the shortcut to heaven. Ultimately it is the Heavenly Father who alone knows the intentions of our hearts. We are accustomed to getting something in return for paying a price. Sometimes we expect our spiritual lives to work that way as well. We may expect something in return when we give up something or deny ourselves pleasure. While we may imagine that God has a ledger sheet where He adds or subtracts graces or blessings based on our performance, God’s way is not our way. God said in today’s Psalms, “Not for your sacrifices do I rebuke you… Offer to God praise as your sacrifice… He that offers praise as a sacrifice glorifies me.” (Psalm 50) God forgives, heals, and redeems us simply because we are His children and He loved us into being. How can we not be grateful to such a God? So the Psalmist wrote, “O give thanks to the Lord for he is good, for his love endures for ever.” (Psalm 136). The very reason why we are here tonight, why we enter Lent with all of our commitments, is because we are grateful to God. 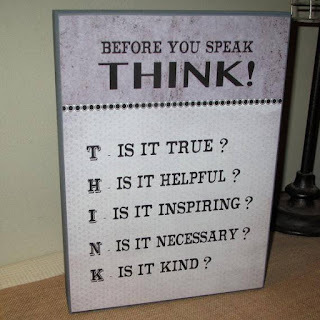 Do you know of a good rule of thumb to use when you are about to share with others your opinion about a person? 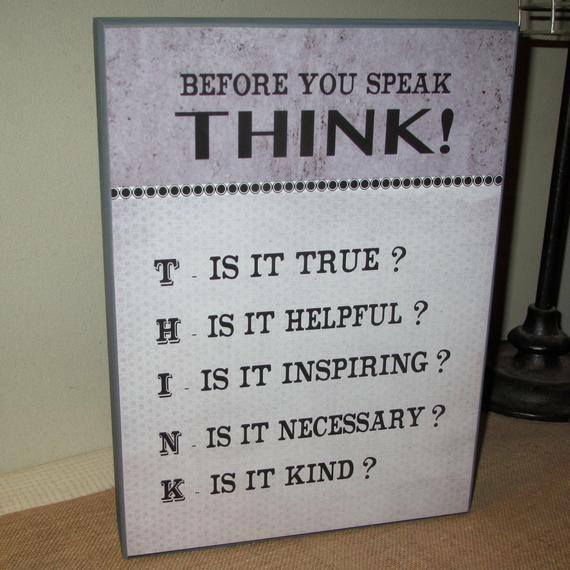 For me, the rule of thumb that comes to mind is to ask the question: is it true, is it necessary, and is it kind? Do you personally practice this rule? For the most part, we all have difficulty controlling our desire to say what is not needed to be said. Who of us has not given into gossiping, bragging, putting others down, exaggerating, flattering, complaining, and lying? Unintentionally we have all made “Freudian Slips” when we unwittingly revealed in our speech what we truly felt inside. A Freudian Slip is nothing new though. Even Sirach wrote: “When a sieve is shaken, the husks appear; so do one's faults when one speaks.” Sometimes we are surprised or even shocked by what comes out of our mouths. Intended or not, when we speak, our words reveal the inner disposition of our hearts regarding others. There is a tendency in us, due to our original sin, to distrust, to criticize, and to presume guilt about others. Yet Jesus was explicit in the Gospel about the dangers of rationalizing our own sins by pointing out the same mistakes in others. 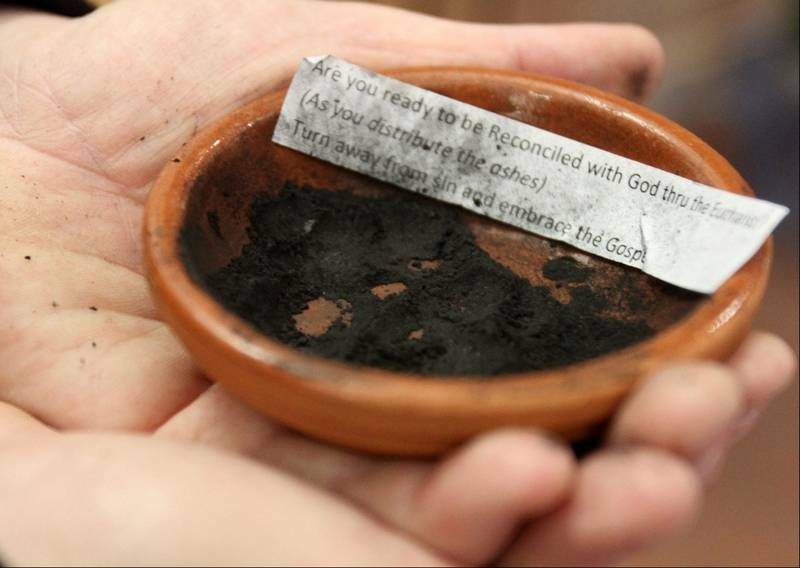 Lent is an excellent time to refocus our thoughts and speech toward love of God and neighbor. We know from our own experience how a few words spoken in anger or our presumptions about someone can destroy a relationship that took years to build. God has already given us all that we need to break away from the trap of our narrow-hearted judgment about others. We can grow in our understanding of God’s goodness through the reading of scriptures, our commitment to prayer, and frequent reception the Holy Eucharist. Do you consider yourself a grateful person? Do you tend to dwell on thoughts such as “I’m truly blessed,” “I’m so glad,” and “we are so fortunate”? Or do your thoughts tend to dwell on burdens, deprivations, entitlements, and complaints? Scientists say that persons with a grateful attitude sleep better at night, have fewer symptoms of depression and anxiety, suffer less from heart disease, and feel more connected to others. Think of what would happen if a priest who had been dwelling on negative thoughts all day, approached the pulpit to preach. What kind of blessing or curse would his parishioners receive at that mass? 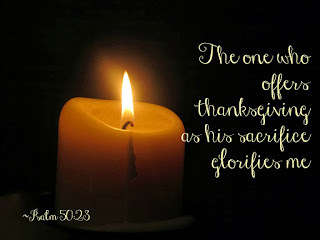 Here is one of the greatest reasons why we should always be grateful: for being chosen as a child of God. Because God is so generous and merciful, he has adopted each of us as His own sons and daughters even though we do not deserve being his children. We should be grateful that God welcomes us as his little ones. In turn, God asks us to welcome the little ones around us just as he did. He is not only talking about the little children but also the suffering, the needy, the hungry, the thirsty, strangers, the naked, the sick, and the imprisoned. When we welcome these little souls who are suffering, we imitate the generosity and mercy of God. When we seize these opportunities to help in some way these suffering souls, we are being “merciful like the Father.” (Luke 6:36) Listen to what St. Faustina wrote, “Today I live, glorifying the Holy Trinity. I thank God that He has stooped down to adopt us as His children, through grace." Should we not then be grateful in all those moments when we distribute God’s kindness, compassion, and patience through our little acts of love?